Orphaned at birth, a nurturing couple adopts Nicoleta in her eleventh summer. As much as she loves her adopted parents, she wants to know her heritage. Which parent is responsible for her emphatic gift? At her college graduation, her fathers give her a DNA test kit and the police reports of her mother's murder. 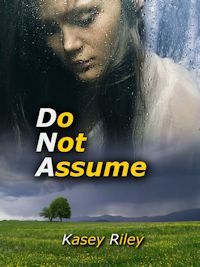 Do Not Assume is a story exploring the statement; "be careful what you wish for". Nicoleta wishes for information and what she finds amazes her. Her genetic makeup is beyond unique. Little does she realize the information she craves is being shared with others who have been searching for someone of her specially modified genetic makeup. How can she escape those who are seeking to capture her, use her in their inhuman experiments? Native American James Woodruff has his own special traits that he has never developed. His Shaman Grandfather has taught him how to handle his innate skills, but James left home before he learned what he now needs to know. Can he help Nicoleta in her quest?